I am writing this in the train on Monday on the way back from Kiel to Haarlem. My sister, six cousins, one nephew and two of their partners, and my long time friend Evelyn visited me in Haarlem on my birthday last Friday. This was the first time ever that I had this opportunity to invite family and friends on my own turf in Holland. Last year in my home they would have had to take turns to sit around the boat’s cabin table. Saturday morning I took a train to Kiel, Germany, roughly a 100 km north of Hamburg on the Baltic side of the Schleswig Holstein peninsula. A three day vacation from my permanent holiday. 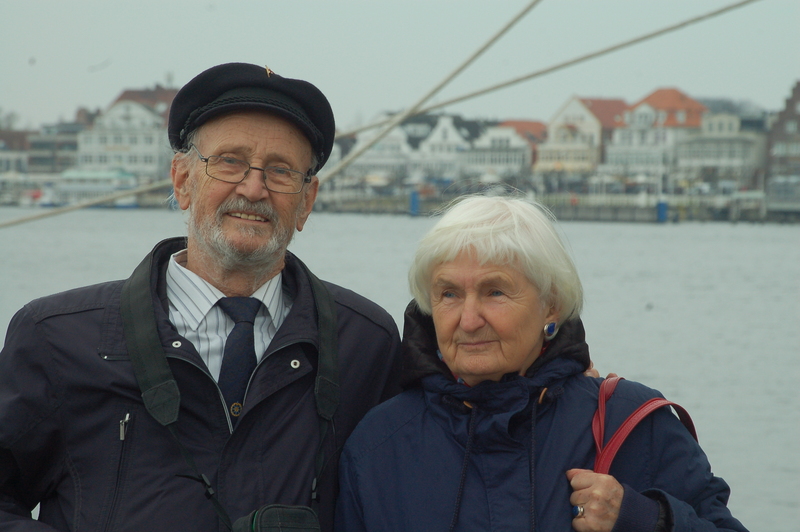 I visited with Wolfgang Dinse and Ingeborg Voss in Kiel. 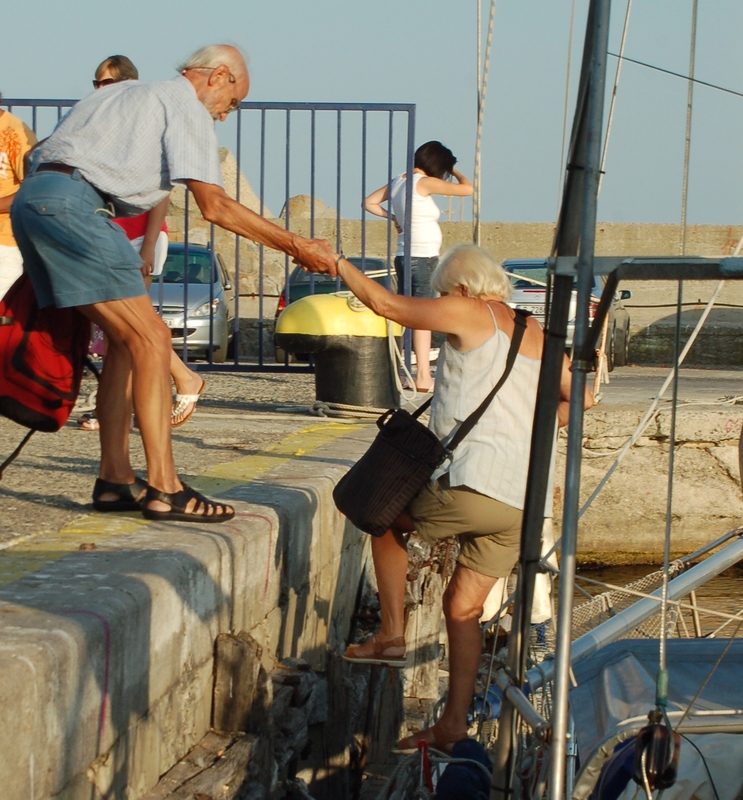 We became friends after we met as dock neighbors in Constanta, Romania on the Black Sea, in the summer of 2011. Wolfgang is two years older than I am and Inge is a couple years younger. 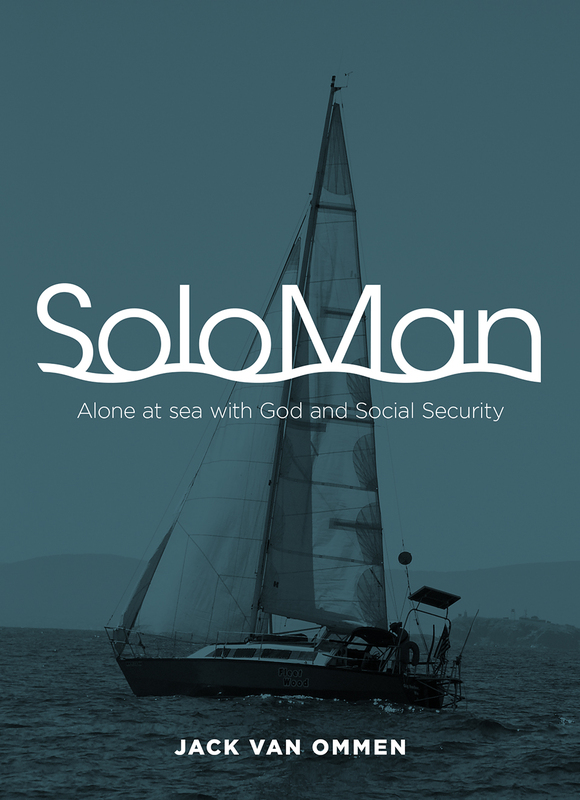 We have visited many of the same places on our sail around the world and even though we meet other sailors along the way it still is a rare opportunity that you get the feeling that they understand what we have experienced. We met up again along the Bulgarian coast and in Istanbul. When we were in Sosopol, Bulagaria, we rented a car and spent 3 days in the country interior to visit historical sites. ( see http://cometosea.us/?m=201108) Inge is the best guide you could ever wish for, she has a fascination with ancient history. 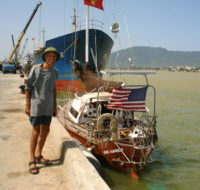 They completed their five year circumnavigation in 2005. 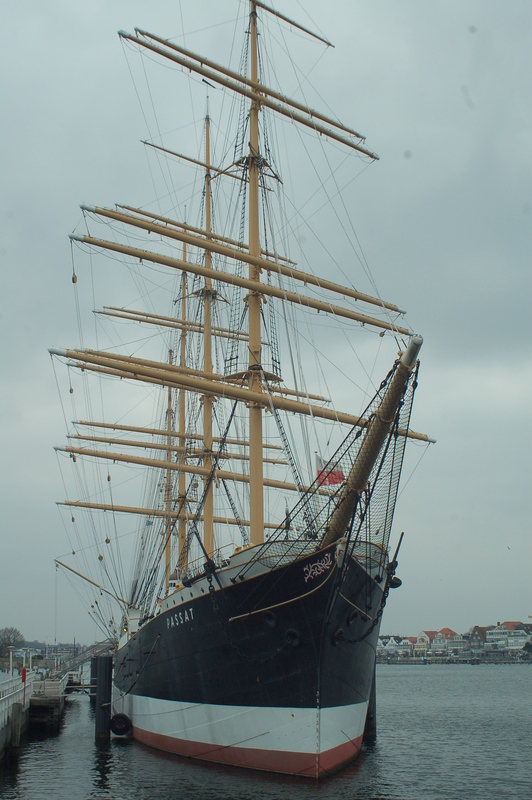 “Stella Maris” is a 33 foot narrow beam steel cutter built in 1971 in Holland. They have sailed from childhood and met each other at the Kieler Yacht Club. Saturday evening they took me to dinner at the Kieler yacht Club. The club celebrated its 125th anniversary in 2012. This was a treat for me to see the trophy display and walk in the temple of European Sail Racing. The Kieler Woche, staged from the K.Y.C., is to the world’s sailing community what the Kentucky Derby is to horse-men and women and Wimbledon to tennis. 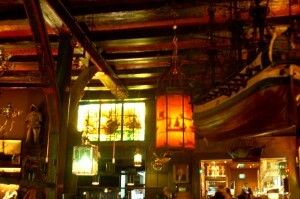 The club counts about 1,500 members. 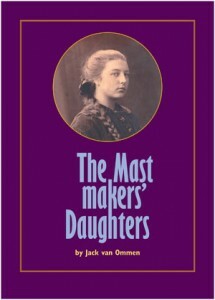 In the book “The Mastmakers’ Daughters” I describe the association the parents of the other (the NAZI) mastmakers’ daughters had with the K.Y.C., which was then still named Kaiserliche Yacht Club, a century ago. Sunday afternoon my hosts took me to Travemünde to see the “Passat” the four mast square rigged bark that is the sister ship to the “Pamir” which went down in the South Atlantic on her home voyage from the River Plate. Afterwards we visited the city of Lübeck one of the important Hanse cities on the Baltic Sea. In the Jacobi church are the remains of the only lifeboat recovered from the “Pamir”. We took a look in the “Schiffarthaus” which was a sort of mercantile exchange where sea captains met and cargoes were fixed. We passed Kellenhusen on the Mecklenburger Sound, where Georg, my cousin and son of the “other” Mastmakers’ daughter lived in the last days of the 2nd world war. In the above mentioned book he describes seeing the lifeless bodies washed up on the beach from some of the 8,000 prisoners killed by allied bombings, just 2 days before the German surrender. The prisoners had been loaded on ships anchored in the Mecklenburger Sound after their death marches out of the concentration camps ahead of the approaching Russian and British liberators. This was one of Himmler’s twisted mind’s ways to dispose of the evidence. Just like Himmler’s plan to drown our mother and her Dachau survivors in the Tegernsee. For details of this dishonorable allied action in the 2nd world war: http://en.wikipedia.org/wiki/SS_Cap_Arcona_(1927) Like Wolfgang remarked, our military now calls this “collateral damage”. 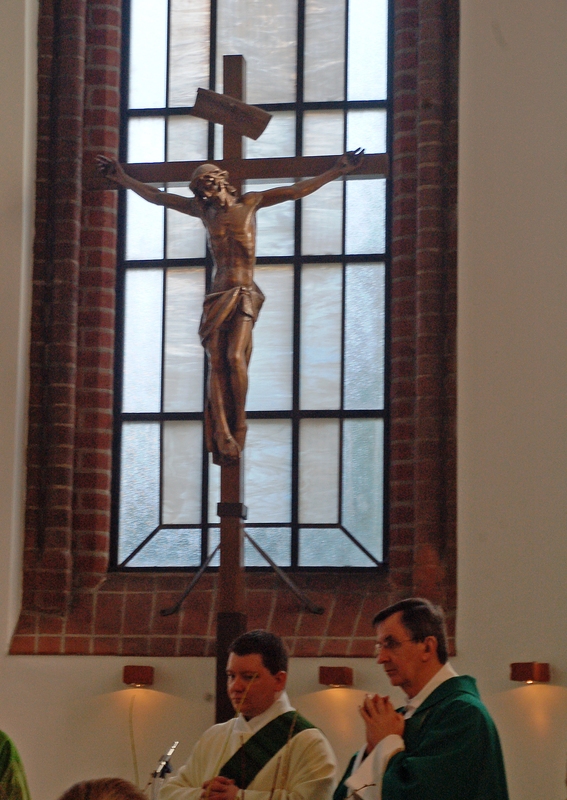 Sunday morning I went to 11 a.m. high mass at Sankt Heinrich church in Kiel. This turned out to be one of the most memorable church services I have had the opportunity to attend. I got my collection money’s worth, like three shows for the price of one. The church was full with an average age about 15/20 years below what I have become accustomed to in Holland. 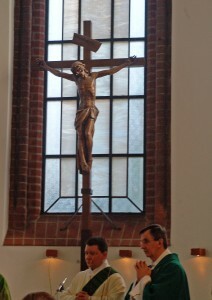 It was a special occasion, the new organ was being officially presented to the parishioners and being blessed by the arch-bishop Dr. Werner Thissen. The first piece the organist, Michael Kalabis, played was “Fanfare” from Aaron Copland. It starts out with a very low un-organ-like repetitive sound, like a foghorn and ends in an incredible crescendo. Everyone was awake. The youth gospel choir “Rich Sound” sang the Sanctus and Agnus Dei from the Mainzer Mass, from the German composer Thomas Gabriel (1957). Accompanied by organ, percussion and base it starts out like a familiar Latin mass and then changes to a Jazzy rhythm. I found it very inspiring. During communion they sang “I don’t know how to love Him” from Jesus Christ Super Star, from Andrew L. Webber. Very well done. The bishop had a wonderful sermon on the importance of music and singing in our worship. My favorite subject. He quoted saint Augustinus having said that God’s secret is revealed to us through music and singing. It works for me. 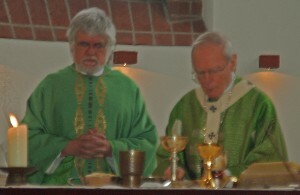 Left Fr.Lemke hospital chaplain Right Fr Dr. Kazimierz Sękala, Polish priest. One of them, I believe Lemke, had his birthday also on Feb 28….